Bigrock India has different type of plans for registering different domain names. The plan starts from as low as Rs 99/yr.- to Rs 599/yr.-. Bigrock Web Hosting plan starts from just Rs 59/mo.-. For more details please visit to the website. Also Checkout Bigrock Free .COM Domain Offer. Bluehost is another well known domain name registration provider that needs no introduction. For Indian clients they offer an exclusive 30% off just like Hostgator or Bigrock. The standard hosting service starts from as low as Rs 167/mo. instead of Rs 239/mo. Business service is for just Rs 230 instead of Rs 329/mo. Pro service is for just Rs 349 instead of Rs 499/-. So visit bluehost India to avail the amazing offers. iPage has over 2 million registered domains users all over the world. The company offers some excellent features like FREE security tools, marketing suite, FREE Cloud Storage, FREE Website building tools which is extremely helpful for any new website owner or business startup. Although the customer support is completely based on US and it's available 24/7. Also check iPage Coupon codes to save more. Although HostGator is an US based hosting company but it is very popular in India too. Registering your domain name with Hostgator could cost you from INR 499 to INR 1350. Their web hosting packages starts from just INR 400/month. The company has good customer support service dedicated for Indian customers only. For more details visit HostGator India today. GoDaddy is world’s largest and well popular web hosting company but we have listed it on 5th position due to lack of customer satisfaction. Recently you have seen many Go Daddy ads on TV, Radio, YouTube and other advertising platforms. ZNetLive is another very good option for registering a domain name. The website domain name can be booked for as low as Rs. 169/year for .in and for .com it is just Rs 619/year. The last but not least name of domain registration providers in our list is Fat Cow. It is also an US based Internet company that charges no money for domain name registration. 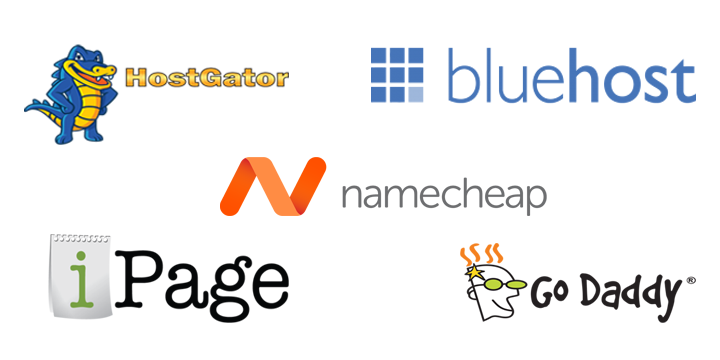 So these are the top 20 domain registrars from India and US that you should consider for. Visit their website and get complete information about their plans. eWeb Guru is totally an Indian web hosting provider. eWeb Guru allows hosting for various platforms like Linux and Windows etc. The cost of hosting is quite inexpensive compared to other hosting providers. For Linux it is INR 595/year and for Windows hosting it is Rs 1395/year. Host Cats is also a well known Indian hosting company. However the cost for booking domain name is quite expensive. It starts with INR 314.99 for .BIZ, INR 249.99 for .IN and Rs 635 for .COM. The web hosting price starts from INR 1449.80 /year for Linux hosting and INR 2640.00 /year for windows. Host Cats is highly professional hosting provider with a good customer care support and service. Name cheap is not an Indian web hosting company but a large number people use them. Name Cheap is an ideal option for people who have small or medium size business. They have huge domain library, you can register a domain on almost any topic related to your business like .dating .shoe, .social, .holiday, .yoga, .science, .camera, .bike, .restaurant, .clothing etc. Name Cheap gives you an option bulk domain names registration. There are many other services that are given by this hosting company. Visit today. Dreamhost is a another well known company like Go Daddy and bigrock. We are listing it on 11 position because it is not an Indian provider. Deamhost has been able to beat its top competitors like Go Daddy and Bigrock and become one of the most popular domain name registration providers. Net4India is an India based domain name registrar as well as hosting company. The hosting package starts with a price tag of Rs 573.85/year including service tax- and they also offer trial with their web hosting packages. However domain names extensions that it suggests is very limited and it is equal to nothing as compared to other services mentioned above in this post. For more details visit. Indialinks is an Indian domain name and web hosting provider. You can register your domain names at Rs 1290/year and the web hosting plan starts from just Rs 450/mo-. Prices are very high and services are not that good. Hosting India is also another most popular Indian hosting company but it is quite expensive as compared to rest of the Indian providers like HostingRaja and bigrock. It also offers service for both of the platform such as Linux and Windows. The unlimited web hosting package starts from Rs 499/month. Visit their website for more details. Square Brothers is also a famous domain registrar in India. The provider is really good for websites particularly targeted in India. However plans are quite affordable compared to other hosts as well as the service is really good for all kind of businesses. Netti Gritty domain name and hosting service is very cheap with starting price of just INR 100 for windows and INR 66 for Linux platforms and reseller hosting is starts from Just INR. 500/mo. You can book .COM domain for Rs. 715.48/year and .IN for Rs. 332.12/year.